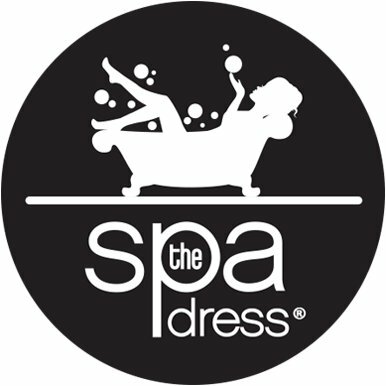 Going to the spa, on a cruise, or even the backyard, The Spa Dress is a perfect piece to have in your wardrobe. I love my new Spa Dress. It comes currently in limited sizing, but in white, black and pink, with more colors coming soon. It's great to be worn so many ways. Great for overnight stays and quick getaways that take you from steam rooms and saunas to boats and beaches around the world. It's also a very easy slip on an off. A Body-Enhancing Cover-Up Wearable UNDER resort robes. Cotton-blend 80-20% spandex adapts to curves. Stretchy top provides light support. A Dress-Before-You-Dress Text message and primp as you wear. Comfy walk-around attire. Dries as you dress. Leaves hands free for everyday errands. A Sundress or Skirt Practical for the sauna but wearable on the beach, by the pool or anywhere your spa excursion takes you, at home or away. Gets rid of the problem of ‘towel dropping syndrome’ at spas, health clubs and in particular, hotel rooms opening doors for room service. I personally will wear it outdoors till I get myself on another getaway! I like that the string ties can be worn up or down, tucked into the dress front, so maybe now I can get rid of some tan lines from sitting outdoors in my shorts and tank tops most of the summer.